From smog-emitting coal plants to dangerous Marcellus Shale drilling to the toxic threat of nuclear power, the ways that we produce and use energy in Pennsylvania have a severe impact on our environment and health. PennEnvironment is working toward a new energy future that promotes clean, renewable energy and uses efficient technologies to help protect the planet. The ways that we produce and use energy in Pennsylvania have a severe impact on our environment and health. PennEnvironment is working toward a new energy future that promotes clean, renewable energy and uses efficient technologies to help protect the planet. Pennsylvania could be doing a lot better when it comes to the ways we use and produce our energy. Dirty, coal-fired power plants pollute our air with smog and soot, and our rivers and streams with mercury. Marcellus Shale gas drilling contaminates our streams and destroys our pristine forests. Nuclear power plants produce toxic waste, and pose the unlikely but catastrophic threat of a Fukushima-style disaster. Unfortunately, many electricity companies, coal companies and other polluters want to continue our reliance on dirty energy sources. These powerful interests are putting short-term profits ahead of our environment and health — and they have unfettered access and influence in the halls of the state capitol in Harrisburg and in Washington, D.C. Electric utilities spent more than $105 million on lobbying in 2011 alone. Now they're pushing to cut Pennsylvania's critical Advanced Energy Portfolio Standard, which supports clean energy sollutions like wind and solar. At PennEnvironment, we have a different vision. We can get our energy from clean, renewable homegrown sources like wind and solar, while creating thousands of much-needed jobs in the state. We can achieve a new energy future where our homes and buildings create more clean energy than they need, where public transportation systems thrive and reduce our reliance on oil, and where technology allows our cars to get more than 100 miles to the gallon. Pennsylvania has the technological know-how and renewable energy potential to clean up and modernize the way we produce energy. Clean, renewable energy sources are in abundance in Pennsylvania — especially wind and solar power — and they can help the Commonwealth decrease its reliance on dirtier, polluting forms of energy. By creating wind power off Pennsylvania’s Lake Erie shoreline, we could create 2,400 new jobs and produce enough power for up to 800,000 homes. Almost half of the energy used in the United States goes to power our buildings. This is 10% of total worldwide energy consumption. 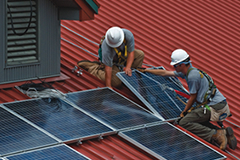 From 2010 to 2011, jobs in the solar sector grew 10 times faster than the rest of the economy.